The next season of "The Ultimate Fighter" set in Brazil will have two of the greatest legends from the country squaring off as coaches, with Anderson Silva and Mauricio "Shogun" Rua taking over duties on the fourth installment of the series. UFC officials announced the pairing Wednesday. While Silva and Rua will be coaching the show together, they will not fight each other at the end of the season. The plan is for both to compete, but against separate opponents when the finals are staged. This will be the first time for both Silva and Rua coaching the show after more than 20 different installments filmed around the world. For the first time, "The Ultimate Fighter: Brazil" will actually film in Las Vegas with the contestants traveling from South America for the competition. "To coach on ‘The Ultimate Fighter: Brazil’ is a dream come true, and an opportunity I wanted for a long time," Rua said in a news release. "To have my team compete against a team coached by a legend and former training partner like Anderson Silva makes it even better! "Me and Anderson go a long way, training together back when we were both aiming to be stars, and to do this with him now on the biggest platform and having a chance to show people what MMA is really about is just amazing! I look forward to finding great talent and helping them become winners!" Nearly 600 fighters showed up for the tryouts for this upcoming season with the focus expected to be on lightweights and bantamweights for the show. Filming for the show is expected to start in early 2015, likely following Silva’s scheduled fight against Nick Diaz at UFC 183 on Jan. 31 in Las Vegas. The show will then air on Globo in Brazil while airing exclusively on UFC Fight Pass in the United States. "A lot of people were worried we’d never see Anderson Silva back in the UFC. But not only is he back in the Octagon on January 31 at UFC 183, he’s coaching ‘TUF’ for the very first time. 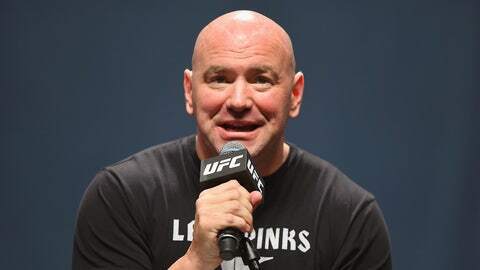 Anderson Silva is as committed to the UFC and the sport of mixed martial arts than he’s ever been, and I cannot wait to see one of the greatest of all time pass his knowledge on to a new generation of Brazilian fighters," UFC president Dana White said. "And if there’s any Brazilian fighter who can go up against Anderson as a coach, it’s Shogun. Shogun Rua has done everything in the sport, and if he trains his team to fight in the same attacking style he’s always used, Anderson’s team is in for one hell of a season." Silva just recently signed a new 15-fight deal with the UFC, and it seems he’s keeping very busy to make sure he fills that commitment. The debut date for "TUF Brazil 4" will be announced in the coming weeks.